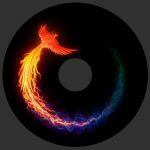 We are interested in your original "Fire Phoenix " to use for album art and possibly tshirts. Is this possible? Αν ακούς και Amorphis, εξηγείται η έμπνευση!! Φυσικα και ακουω το nickname απο εκει προηλθε! Δεν πιστευω να ειμαστε οι μονοι που το κανουμε αυτο! Could I use one of your phoenixes for fixedpoetry please ? Of course I will creedit your name and deviantart at the bottom. I will fix text onto your imagery ? Not really understand. This is for personal use? Any phoenix ? I will show you the finished work afterwords. Thank you Christos. I am jessica. not any some is copyrighted. Show me first. Could I get the permission to use your beautiful Phoenix for a flyer? This flyer is a volunteer work I contribute for a spiritual workshop. I've seen this one looking on image search a year or two ago, before I made a DA account, a lovely picture to come back to. <3<3<3 Gorgeous colors! This is my favorite phoenix drawing that I've seen by far. I've been searching for art to use on a marching band shirt that I'm designing and I was wondering if I could have permission to use your beautiful piece of art. The shirts are not for sale, they are just for my section. Our marching show is titled "and from the ashes.." It tells a story about war, rebirth, building from the ashes; like a phoenix. Thank you but i can't give you the permission to use it as t-shirt. I would love to use this as a tattoo. Would that be alright? I would love to use this as a tattoo to celebrate my 5 years of being free from breast cancer. May I have permission to do so? Hi Christos, this is truly stunning! 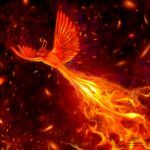 Phoenix is an important symbol for me (I am a firewalk instructor amongst other things) , may I please use it on a flyer together with your name? I'd be grateful! Hello Ruby. What is that flyer about? Fantastic art! I have a chapbook of poetry that is scheduled for an early 2016 release through Houston-based publisher Transcendent Zero Press, and I've been searching out Phoenix images of late for potential cover ideas. This image has struck me more so than any other so far, and I was wondering how I could get in touch with the artist to discuss the possibility of using it for my book. My email is: 17Numa@gmail.com. Thank you. Hello! Thank you for your comments and for the print. Yes you can use it as tattoo and of course i want to see the result!! Do you mind if I use this for class? Can I use it for a concert flyer for a local thing? Of course I'd credit you & send you pictures!